After 40 consecutive years and more than 140 consecutive performances, our Good King Wenceslas has chosen to retire and name a new successor. 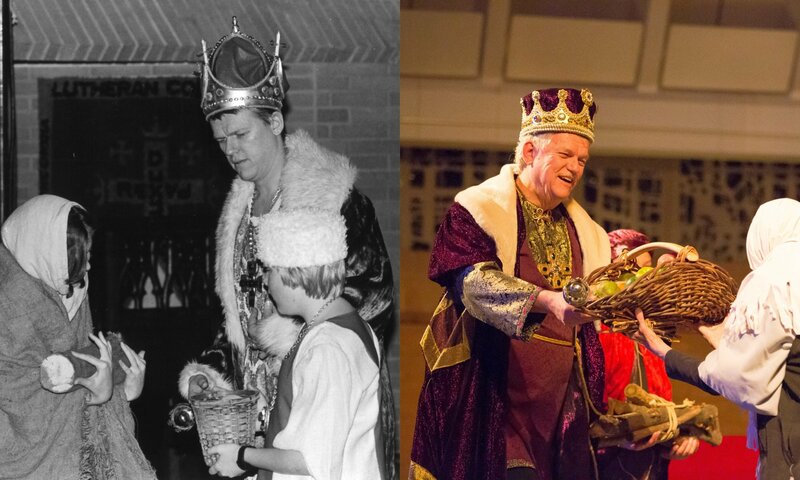 Dr. Neil Skov, Concordia University’s emeritus professor of science, began the role of King Wenceslas in 1978 and has performed in each performance since. It’s unclear to the extent that type casting was used for the original roles back in 1978, but there was clear type casting for this role. Dr. Skov’s benevolence, humility, and love for his Lord (standing well over six-feet tall also may have helped) made him the perfect choice then and his consistency and strength of character would be the central glue that bound together this Concordia Christmas tradition for decades. Of course, audiences might not have known the man behind the royal purple robe, only appreciating his penetrating, warm singing voice and his nurturing presence to his young court page. They wouldn’t know that he was a calming presence year after year, patiently guiding his newly appointed pages, working with several directors, providing a voice of solidarity, focusing our attention on who Dr. Skov regularly said was the main role: the baby Jesus, our King and Lord. I was blessed to work with him for a comparably short period – we performed 45 shows together. The Neil Skov with whom I worked for our first performance was the same Neil Skov who finished Concordia’s 40th Annual Boar’s Head Festival last year in 2017. Early on, he would remind me that a certain tempo was a little brisk or that we needed more sound from one of our singing three wise men, but his voice was always kind and gracious, and he was regularly complimentary and appreciative. Were Neil ever to be given his own country where he would be crowned King, his people would have been served well, with an added emphasis on the service element. Speaking for the tens of thousands who have seen Dr. Skov perform, and the thousands of cast members who have worked with Dr. Skov, it is unequivocal that we have been well served by his generosity and love for what he gave. Upon his full-time retirement from Concordia University – he had been serving for many years as a part-time instructor since his initial full-time retirement – Dr. Skov agreed to continue serving in an advisory role for our Boar’s Head Festival, but said he would step down in his role as King Wenceslas. He presented us with a potential successor, Jonathon Neuendorf, and after brief consideration, we agreed that this would be our ideal King. Is there irony that Dr. Skov would recommend someone with a tremendous scientific mind with a remarkable singing voice who happens to be tall in stature and full of integrity? There may be further irony in the fact that of Jon’s entire family (two sisters, a brother, both parents), he is the only one who didn’t graduate from Concordia University Ann Arbor. Though he studied engineering at Kettering University, Jon is a Concordia step-child to say the least, and his ascension to the throne follows a meandering path that supposes logic. Jon was a guest singer in the Concordia Choir for many years, studied voice through our vocal department, and played many of the roles in Concordia’s Boar’s Head festivals as a youth while attending St. Paul Lutheran School in Ann Arbor, including the role of King Wenceslas’s page. For sure, he has been well prepared for this new role. Jon is exceedingly enthused about his new role as King, but first, he had some personal business to attend to. Jon recently found his queen, Kelsey Kruger, and following their late October wedding, the new king and queen travel to Italy for a couple of weeks to celebrate their marriage. The Concordia Boar’s Head has never been about signed contracts or legalize, yet we do make the assumption that Jon will, at least, match the tenure of his former king! The 41st annual Boar’s Head Festival will take place in Concordia University Ann Arbor’s Chapel of the Holy Trinity on Friday, Nov. 30 (7:30 p.m.), Saturday, Dec. 1 (7:30 p.m.), and Sunday, Dec. 2 (4 p.m.).